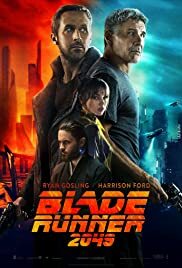 Sequel to the original Blade Runner that has a few twist and turns to think about. Great cast with Ryan Gosling, Jared Leto, and hottie Ana De Armas. Also, has Harrison Ford that adds the twist to the plot! Liked the movie; had to watch the original first before watching it, just to refresh my memory of the story line. For more see IMDB.